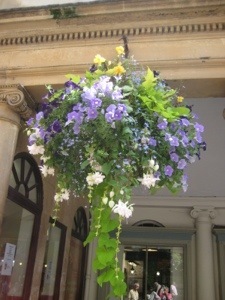 Keith and I had never been to Bath, so Ursula took us there this week. 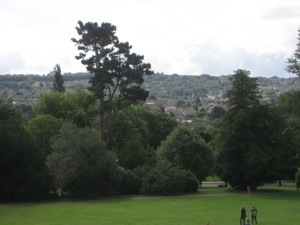 We drove along the Bath Road through many picturesque villages and parked in the Park “n Drive and caught a bus into Bath. 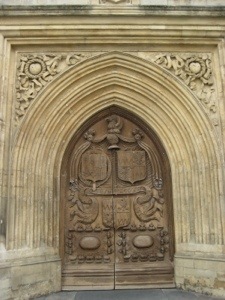 We explored the Abbey and I was captivated by the Bath Abbey Diptychs. 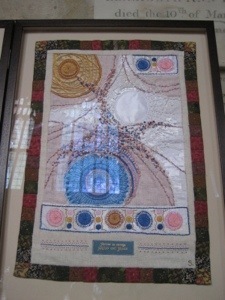 Created by Sue Symons, they consist of thirty five panels and depict the life of Christ. 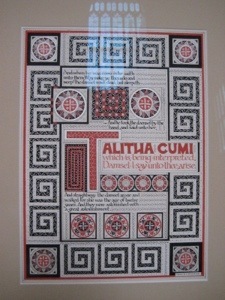 Each panel has two pictures – one of calligraphy, the second is a textile picture combining embroidery and fabric and quilting. They are displayed along one wall of the Abbey. I took many photos of them, but the light from the windows opposite are reflected in the glass. They are creative, beautiful and amazing. It took the artist one year and 3,000 hours of work – exquisite! 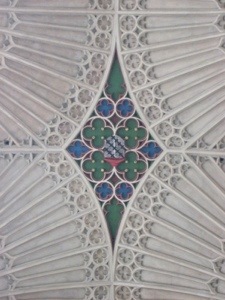 this is the ceiling of the Abbey – a small bit of it! 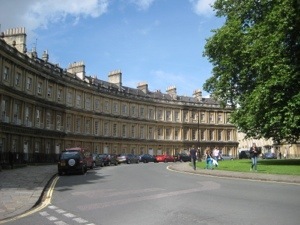 Bath was a town that the wealthy visited to stay for up to six months at a time – they would “lodge” in one of these glorious homes, spend time visiting the baths, socialise, eat, drink and fill in time. Bath was in its hey day from around 1700 but by 1800, Brighton had become “the place” to go. 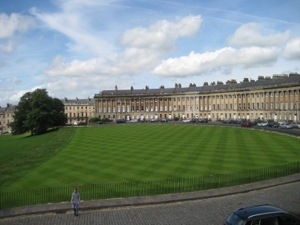 Jane Austen didn’t visit Bath during its prime time, nor could her family afford to stay in one of these “lodgings”. We visited Number 1 Royal Crescent Bath – the first house in the Crescent that has been turned into a museum and furnished exactly as it was in 1700. This was interesting and the guides were most entertaining – making us laugh and laugh with their antics and stories – one of the guides took herself far too seriously, while another entertained us with stories about her own life and gossip about the other guides. One of the things that I had not thought about was the smell and matters of sanitation. The dining room had a screen and if a man wished to relieve himself, he merely went behind the screen, while women went upstairs. There was no running water or heating or a bathroom of any kind. I can’t imagine what this would have been like. This entry was posted in Travelling and tagged Bath, Bath Abbey Diptychs, Georgian houses. Bookmark the permalink.